Verizon and AT&T were profitable last quarter but T-Mobile and Sprint posted loses. *Estimated. 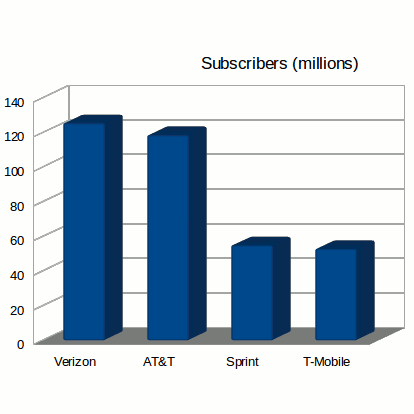 Verizon doesn't report wholesale and M2M subscribers numbers. Verizon reported 106.2 retail connections at the end or Q3, 2014. Industry analysts estimate that Verizon has approximately 125.5 million total subscribers, including wholesale and M2M connections. América Móvil's Tracfone subsidiary, which operates under the Straight Talk, NET10, Tracfone, Simple Mobile, Page Plus, Telcel America and SafeLink Wireless brands, and is by far the largest prepaid MVNO gained 414 thousand subscribers last quarter. ATT needs to replace ALL Cricket customer service reps and give the corporate store reps authority to make changes to customers accounts. I recently asked the store manager to waive the $25 fee for 5 new lines. She had to go through the same online chat process the public does to get approval from one of Cricket's overseas customer service reps. I couldn't believe the logic of placing an overseas contracted rep over a store manager. AT&T is running Cricket into the ground. Only the blind diehard HoFo Cricket fans are willing to stay with Cricket and talk up Cricket while most everyone else is dropping any and all at&t prepaid services. +1 - Agree - Cricket CS is terrible. Their CS at the present time is down there with the worst ones in the industry (you know who). "ATT needs to replace ALL Cricket customer service reps and give the corporate store reps authority to make changes to customers accounts. " Bad CS and all, Cricket has the best coverage combined with a great data to price ratio. Nothing comes close right now. Right, nothing close because Harbor Mobile offers FAR more value for the money than the Chirp-Chirp brand. Not if I want to actually use data. Harbor's coverage is lousy... There is none where I am, while Cricket has strong coverage every where I go. A "good deal" is worthless if I can't use it at all. It's not all about you. Harbor has free data roaming on AT&T and regional carriers. It's about me. A consumer. Looks like the only roaming data Harbor has is very slow 2G. A fraction of what even the limited Cricket had. Unless I am wrong and Harbor has 4G roaming on AT&T, instead of useless long-outdated 2G. Then I will eat my hat and sign up for Harbor Mobile tomorrow. Sprint will have to find a buyer soon or they will be chopped up in BK court, I don't think SoftBank will be willing, or can afford to, lose Billions for long, like they do now. Do the AT&T prepaid losses include Cricket together with GoPhone? I was perhaps thinking that it was just Go-Phone subscribers. The reason that Verizon was the least in Prepaid at first was because they didn't allow 4G till October. I bet now that's about to change with full LTE speeds on Prepaid. TracFone could start to lose if they keep throttling down Verizon network MVNO's like Page Plus and Straight Talk which could allow AT&T to rise. With their new $60 plan on AT&T Gophone it could make things interesting for AT&T. We'll have to see in the next report but it should be loud and clear that customers want full quality 4G smartphone service on prepaid. "Full Quality 4G" service doesn't exist yet. LTE-A is your best bet. You're incorrect. I've been on Verizon ALLSET prepaid 4G LTE since July 17th. It is unthrottled. Page Plus began in October and it is throttled to around 5mb/2mb. Wrong on both accounts. Verizon added 4G to Verizon Prepaid July 17. Page Plus got it in October. Also it's Verizon that's throttling 4G speeds on Page Plus. Verizon is one savvy company, like em or hate em. Love them. In my area, Verizon is sueing an out of control county government that has blocked large areas of the county from cell coverage by zoning. I hope they win, and it sets a precedent. Yeswap I like how you recapped the results of carriers results without making it all long and boring unlike other sites. Have you thought about writing more general wireless stories besides just a few every now and then/prepaid only? And Verizon has been offering 4g lte since mid July @Unknown so it's been a couple of months you would think they would add more customers than a measely 9k for xlte their baby on prepaid finally so as for your Verizon Prepaid logic you're wrong maybe you meant their MVNO's. As for Cricket this is why I understand why At&t is in a hurry to shut down their old legacy network. At&t should take a full 2 years to try to convert customers over to the new Cricket running on their network. At&t has more than enough spectrum and can be patient with the shutdown. Yeswap I like how you recapped the results of carriers results without making it all long and boring unlike other sites. Have you thought about writing more general wireless stories besides just a few every now and then/prepaid only? And Verizon has been offering 4g lte since mid July @Unknown so it's been a couple of months you would think they would add more customers than a measely 9k for xlte their baby on prepaid finally so as for your Verizon Prepaid logic you're wrong maybe you meant their MVNO's. As for Cricket this is why I don't understand why At&t is in a hurry to shut down Cricket's old legacy network. At&t should take a full 2 years to try to convert customers over to the new Cricket running on their network. At&t has more than enough spectrum and can be patient with the shutdown. That's Right don't know why I typed Oct on Verizon. But I sure bet Verizon's Prepaid subscriber base rose twice what it was on 3G as soon as LTE was allowed on Prepaid. However it don't make much sense for Verizon to throttle Page Plus down however maybe a clear message was sent when users were upset and some may have or was ready to let their Page Plus accounts die out and go with another provider. I do know Verizon was very slow to allow 4G on prepaid as was US Cellular. But we are moving on to 2015 and with that in mind and the fact you can get some good Postpaid phones on used sites and pawn shops (at least around here) it could mean a rise for Verizon prepaid and US Cellular prepaid around here. 7 MILLION NEW CUSTOMERS GAIN in 1 quarter.. this looks hard to believe!!! how many lines per person is the new average now? after all these years would think lower TRUE NEW net gains.. or are even kids using multi-lines now too? Maybe those 4/5 lines for $ one price deals are bought even if extra lines aren't needed? how much of the gain are tax payer/ deficit funded? GOVT expenditures alone... shouldn't that over the years have keep the carriers well funded and in the black?? guess not.....or do they not buy from all four? T-Mobile Details LTE Expansion Plans. Source:Phone Scoop.